As Amitabh Bachchan’s booming voice, sung (a slightly-tweaked version of) his own popular track, gyrating with thirty-odd beauties, millions of eyeballs applauded. The song-dance sequence by Amitabh officially kicked off the much-awaited fourth edition of Kaun Banega Crorepati. As talks about the fourth edition of the country’s most popular game show (which gained immortality through ‘Slumdog Millionaire’) started, there were enough apprehensions. The KBC journey was all downhill – the show progressively plummeted in popularity, season over season. While KBC 1 was shot Star TV to the number 1 slot, Season 2 failed to reach the same level of success, although TRPs hovered around an impressive 9-11. But it had its premature death, with Amitabh falling sick before long. Shah Rukh tried to repeat the AB magic with KBC3, but in vain. Even though the Khan received filmfare awards for the best TV show host and the show was declared the best game show, TRPs did hit rock bottom. Having burnt its fingers with KBC3, Star TV laid hands off the new edition of India’s most popular game show. Sony Entertainment Television grabbed the opportunity with open arms. Amitabh was back in the reckoning, and the process of ‘return’ started. The core-team had not changed – Sidhartha Basu was still in charge of the groundwork – namely, the questions. There were apprehensions though. With a melange of game shows on TV, would the viewer opt for good-old KBC? The auditions started. Over 50 lakh people stood in endless queues, and filled endless forms – for that one-on-one with the star of the millenium. KBC had arrived, once more. Ten among those 5 million applicants made it to the final round. From a mass communication student to a chef – these ten people hailed from ten different parts of the country, from ten different backgrounds. One of the contestants was a participant in KBC Junior. When informed of the fact, Amitabh jokingly-remarked: “Thank you for making me realize how old I am,” graceful words from a gracious actor! The contestants had settled down – it was time for the ‘Hot Seat’ question. “Arrange the following words of this Hindi proverb, in order,” the booming voice instructed. 3.53 seconds later – Rajesh Chauhan, from Jheemar UP, clad in a green shirt and a wide grin, walked onto the hot seat – The lucky first participant of KBC4. “Chale hum, aur aap khelte hai Kaun Banega Crorepati,” Amitabh’s voice echoed with a magical boom. Chauhan, who runs a general store, said that he has been preparing to attend the show for over a decade. Slight changes were made to the KBC format, to keep with the times. Like the previous editions of KBC, this one also has 12 questions, with prize money starting from 1,000, going on to 1 Crore. Amitabh announced a surprise package later on – there was a 13th ‘jackpot’ question too, which would give the winner a whopping 5 Crore. The first two questions had a time limit of 30 seconds (The ‘Khadiya-babu’, takes a side-seat with ‘Computer-ji) – the question stands cancelled if participants fail to answer it on time. The remaining questions will have a time limit of 45 seconds, until the 7th question – after which, ‘Khadiya-babu’ remains suspended. The prize money-increments remain the same, however. The ‘lifelines’ have been slightly tweaked – There are a total of four lifelines, this time. The first three – ‘Audience Poll’, ‘Phone a friend’ and ‘Ask an Expert’ – will be available throughout the game. ‘Ask an expert’ is a new ‘lifeline’ – where experts on a domain will be assisting contestants, with their questions. The fourth-lifeline is a modification of 50/50 – the ‘Double Dip’. It will only be available to contestants after the seventh question (after winning the 3,20,000 price). In double dip – a contestant can answer twice. That is, he could answer wrong once, and get away with it, only to try a second time. Quite interesting. Charu Sharma was the ‘expert’ for Episode 1. Through videoconferencing (apparently – it could even been an earlier recording), he wished Amitabh a happy birthday (the show was telecast on Amit-ji’s birthday) and Chauhan good luck. Chauhan had a surprise in store – his favourite actor, Sanjay Dutt was with Charu, on the screen. Chauhan was enamored with surprise. So much for being the first contestant in the country’s most popular game show! Chauhan, a wide-eyed village dweller appeared calm and confident. His preparation showed, and his answers were quick and spot-on. From easily identifying the “orange city of india” (Nagpur), to presciently realizing the chess piece occupying the maximum position (pawn), Rajesh Chauhan enjoyed a dream run. He was not sure about India’s first spaceship to moon – and needed a lifeline to opt for ‘Chandrayaan 1’. Charu Sharma helped him out with the seventh question, telling him that NREGA was named after none other than the father of our nation – Mahatma Gandhi. Rajesh Chauhan made Rs 3,20,000. Amitabh had twelve cheque leaves ready for each contestant – signing cheques as rounds passed. Chauhan had bagged his 3,20,000 cheque. That was when Amitabh broke the 5 crore ‘jackpot’ prize that was kept under the hood until then. The crowd was euphoric, and Chauhan was tensed – now he had to get home with the 5 crore. Bachchan shot his eighth question – Rajesh had to identify what these four were: Gyaneshwari, Lichchavi, Gorakhdham and Sarayu. After a lot of thought, Chauhan correctly identified Lichchavi and Sarayu as rivers and went for the same option. Bachchan quizzed him repeatedly: “Is this your final answer?” Chauhan nodded. The four are express trains plying through the country – and the four suffered accidents over the past year. Chauhan’s face wilted in disappointment. Probably realizing that every emotion of his was being captured by ten-odd cameras, he doubled up and smiled – smilingly accepting his 3,20,000 cheque (30% of which, he’d be losing to the Income Tax department). The show was not over for Chauhan. Before he could bat an eyelid, lo and behold, Sanjay Dutt walks into the studio! Rajesh was overcome with happiness – and Sanjay gave a warm ‘jaadu ki chappi’ to the general store-propreiter. Together, Sanjay and Rajesh sung ‘Happy Birthday’ to Amitabh, and both of them left the studio. It was time for the next ‘Fastest Finger first’ – and the nine remaining contestants peered onto the television screens. This time, the contestants had to arrange members of the ‘Kapoor’ family in decreasing age. Only 3 got it right, and Alok Kumar, from Orissa did it in a little over 5 seconds. This dude, a self proclaimed quizzer, was severely hit by the ‘heat’ of the hot seat. Tensed to the core, Alok was un-nerved, and used up both his lifelines in the first three questions. Before Amitabh could ask the fourth question, the famed ‘KBC alarm’ rang – and the show was over, one and a half hours later. KBC-1 was all about seeing the charm and charisma of the Big B in the small screen. Season over season, the charm wilted out. The Shah Rukh effect, maybe – it was a pleasure to watch Bollywood’s biggest superstar on the small screen, once again. The wait to see Bachchan-saab on television was indeed reminiscent of the same feeling I all went through, ten years back. Big B is bigger, KBC has changed (a new logo, a new format and a new channel) – but the charm and the appeal remains the same. KBC4 has nothing new to offer, it’s the same old wine – which now tastes better, having aged by ten years. KBC4 is not just a trip back to memory lane; it maybe reworked trivia quiz – at times a tad too trivial, but it’s a show that affects you. It’s one show, that you’ll be able to recall – scene-by-scene, question-by-question. 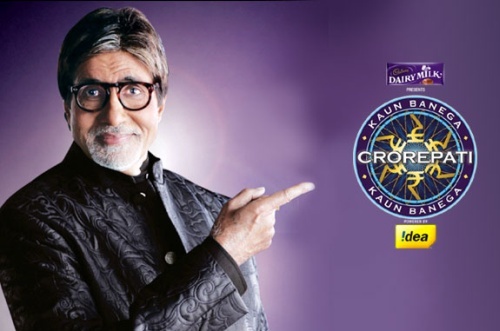 Do watch Kaun Banega Crorepati 4 on Sony Entertainment Television, every Monday – Thursday, at 9 PM. Especially, those of you who missed out on the earlier avatars – you’re gonna love it, trust me. Image Courtesy: setindia.com, Wikimedia Commons. Back with a bang, aren't you, these days?? we are very very intrested to last 5 years to play the kbc . hey Mr.Bachchan u r doing a v.good job. n im vry happy that u strtd the kbc4 . my pals r big fan of urs.